Time to appreciate Leopold Stokowski, whose many merits are obscured by negative reactions to his flamboyant showmanship, his exaggerated Slavic accent and his willingness to have fun with music, making zany transcriptions and appearing with Mickey Mouse in Fantasia. Toscaninni, no slouch himself at self-promotion, might have been sniffy, but rivalry sometimes plays a part in assessments. I like Stokowski's transcriptions - at least he was honest, as opposed to conducting his own take on things. And what's wrong with bringing millions of kids, all over the world, to classical music via Disney ? At the moment, I am on a Stokowski listening kick, impressed by his dedication to music. The name "Leopold Stokowski" was absolutely authentic. He was registered at birth as "Leopold Anthony Stokowski" in the district of All Souls in Marylebone in 1882, His father was Kopernick Leopold Boleslaw Stokowski, a cabinet maker, and his mother, Anne Marie Moore, was born in Northampton. They seem to have been Church of England. Leopold was a choirboy and, after studying at the Royal College of Music, worked as an assistant to Sir Henry Wolford Davies at the Temple Church in the City. In 1905, he moved to the US but didn't really lose his English roots, conducting more British repertoire than one might assume. He conducted Elgar's Symphony no 2 in Cincinatti in November 1911 - just six months after its premiere in London, conducted by the composer himself. New music, hot off the press ! 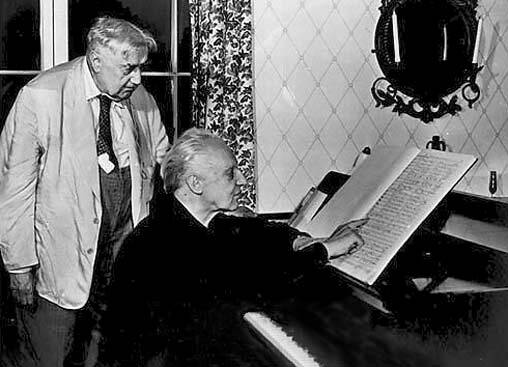 He also conducted the Enigma Variations, and Holst's The Planets, also new at the time, Ralph Vaughan Williams and Walton's Belshazzar's Feast only three years after its UK premiere, when Walton still had the reputation of being avant garde. All his liife, Stokowski was open-minded, and alert to what was interesting in musical terms, regardless of whether it was popular. He was instrumental in bringing Charles Ives to prominence, conducting Ives's Symphony no 4, then considered unperformable, even by the composer himself. He even arranged a nationwide broadcast . Imagine that happening on TV these days, in our supposedly enlghtened times when "intellectual" and "creative" are terms of abuse. Later, his protégé, José Serebrier, recorded the piece in London, using Stokowski's principles of orchestral preparation. Please read more HERE about the relationship between Stokowski and Serebrier, which endured until Stokowski's death. Just the account of how they met is fascinating. 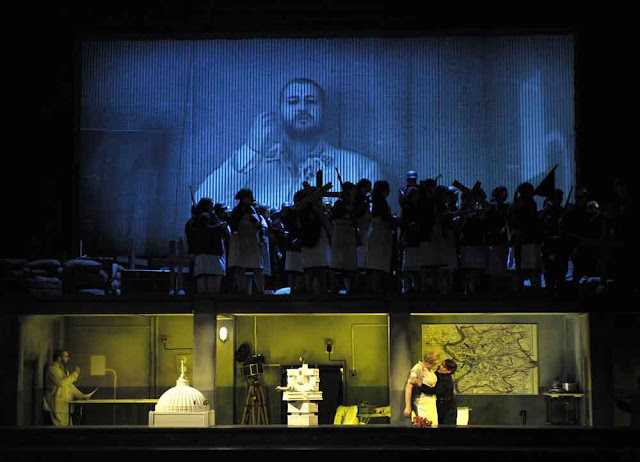 In many ways, Serebrier continues Stokowski's legacy, and desrevs similar respect. At some stage, possibly under the influence of his first wife, the pianist Olga Samaroff, Stokowski adopted a "slavic" persona. Samaroff was in fact born Lucy Hildenlooper in Texas, but in those days having an exotic background helped create careers. Whether real Russian or Polish people could see through the pretence didn't matter. Nowadays such things would trigger counter-terrorist and money laundering systems. By 1940, however, Stokowski was well established and able to tell the US census that he was British born, though he shaved five years off his true age. Eventually, he moved back to Britain five years before his death aged 95. He's buried in East Finchley. Throughout his life, Stokowski remained interested in music that was innovative and stretched the mind. Like so many other musicians - Debussy, Stravinsky, Benjamin Britten, Messiaen - he wa fascinated by non-western form and travelled to Asia in 1927-8. He spoke coherently about Asian music and conducted Aaron Avshalamov's Hutungs of Beijing (1931) in 1935, presumably having met the composer. Although the piece describes cluster housing in old Beijing, it's not a cultural hybrid but western music with oriental spice, delightful, but not authentic. About 25 years ago recordings were made of Avshalamov's major works, which I received from a friend who was a neighbour of the composer who returned to the US in 1947. Much more adventurously, Stokowski conducted the work of Hidemaro Konoye (1898-1973). Konoye was a bona fide Prince, a scion of the Fujiwara Clan, which goes back 1500 years and is closely associated with the Imperial Household. His brother was Prime Minister of Japan. Konoye trained in Europe, studying with Franz Schreker, Karl Muck and Erich Kleiber. He was a friend of Wilhelm Furtwängler and Richard Strauss, he conducted the Berlin Philharmonic and founded the New Symphony Orchestra of Tokyo (now the famous NHK Symphony). They made the first ever recording of Mahler's Symphony no 4 in 1930, one of the first to use the then new electric technology.So much for the idea that Mahler was unknown til the 1960's. Stokowski conducted Konoye's Etenraku (1931) three times in 1935 with the Philadelphia Orchestra. What the audience and orchestra made of it, I don't know, as it is genuine gagaku music, orchestrated for western instruments. Gagaku was an aristocratic genre, heard mainly in court circles, never "populist". But it is a fascinating piece, listen to a clip HERE, conducted not by Stokowski but by Ryusuke Numajiri. who's probably more idiomatic. Perhaps Stokowski knew Konoye who was extremely well connected. Stokowski conducted in Japan several times during Konoye's lifetime. Konoye, incidentally, was arrested and imprisoned by the US when he was leading a group of Japanese musicians back to Japan after the war, which they'd spent in Germany. Technically "enemy" though they weren't involved in atrocities. Within an hour after writing this a readere came up witha clip of Stokowski conducting Konoye's Etengaku. Sure enough, it's not very well done, which is quite understandable in th circumstances. Numajiri has probably heard a lot more gagaku in his time.